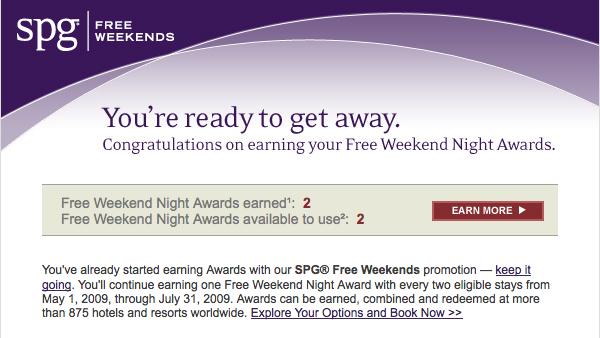 Following up on my last article, SPG is finally showing free weekend nights awards online at spg.com (you have three more days to earn another free night which can be redeemed before the end of September 30, 2009). To check your SPG free weekend nights status, login to SPG’s website, select account information, than under Starpoints@ Awards, click “My Earned Award” link. The My Earned Award page should show you the number of free weekend night awards. Reminder, they expire end of September and are running out of rooms fast. Use them or lose them. Quick update: I just booked a category 5 hotel for labor day weekend. The process took a little bit since everyone is saving their awards for the last minute august/september travel. The spg operator has to search date by date for the hotel of choice. I had the operator search through each weekend in september for numerous hotels until we luckily found one. Book quick for the higher category hotels. Following up on previous post regarding how to check status, SPG has responded with email notifications. Previously, the only way to find out the number of free weekends awarded was to call SPG’s award winning customer service. The e-mail I finally received was a pleasant surprise. Another reason to bank at Starwood (more reasons why hotel points are more valuable than airline miles), they respond to demand and answer! How to redeem SPG Free Weekend Nights? The entire SPG Free Weekend Night promotion is done offline. You will have to keep track of your own stays to make sure you get free weekend night credit. You will have to ring customer service directly to make each booking. SPG could have saved a lot of money and hassle (dealing with customer calls and emails) had they listed the above bulletpoints on their FAQ site.